PRIVATE BEACH FRONT ON GULF OF MEXICO W/PANORAMIC VIEWS OF GULF AND INTERCOSTAL. SPECIAL RATES AVAILABLE FOR SELECT DAYS. FOOTPRINTS VACATION HIDEAWAY - AT West Coast Vista. Your family vacation awaits you in this beautiful, private gulf front condo located directly on the beach with 2 balconies leading directly to miles of sugary, white sand and pool. Breathtaking sunsets over the Gulf of Mexico's shimmering waters and sunrise on the inter-coastal balcony. Accommodations are unsurpassed in this unique spacious 3 bedroom/2 bath beach lovers condo. NOT ONE -- but TWO FULL BALCONIES! Enjoy the gorgeous views of the Gulf of Mexico from the private balcony off the master bedroom and dining room; and/or when the sun sets to check out the second balcony located off the oversized family room. Enjoy cocktails on our second balcony with views of the intercoastal and our private fishing dock where you can watch yachts sail back to the marina at the day's end. Also fantastic to watch the sunrise from this balcony. Be sure to catch the dolphins at play from either balcony. (Check out our guest comments) Our spacious, bright, corner unit is located in a small, secure building and includes all the comforts of home. Private elevator, accessed only by key holders, takes you to your front door; or use the stairwell from the Gulf side balcony to access the pool/beach. Great for families with children -- you can see your little ones on the beach from the balcony! That's how close you are! Our kitchen is complete with all the necessities of home. Supplies include pots, pans, dishes and all you would need to prepare a meal at home. Master Bedroom En-suite - Located on the gulf side of this unit complete with comfortable king size bed, TV, walk-in closet. Roomy sitting area perfect for dolphin/manatee sightings or whatever would please you in the privacy of your bedroom. This room views the Gulf of Mexico with sliders to private balcony. Stairwell to the pool from this balcony is convenient. (2nd Floor) The balcony is private in that people cannot see you from other units or pool area. Great for coffee in pj's or sunbathing! The second bedroom is decorated in an aqua sand dollar/starfish theme equipped with comfortable twin beds which can be pushed together for a King size bed. The third bedroom is decorated in bright coral and aqua starfish, sand dollar motif. Complete with queen size bed. Fishing poles, rainy day games and bed rail stored in the closet. This room overlooks the neighbor's pool and lush greenery. The family room is oversized with fireplace and desk on one side of the room and 32" TV, comfy leather couches and recliner on the other side. Watch TV or enjoy the views from either side of this room. Catch the action on the inter-coastal and fishing dock; access to 2nd balcony with a great view of the inter-coastal and Gulf Boulevard. Unbelievable sunrises from this balcony. Laundry Room - complete with new washer/dryer. New Air Conditioner. You will find this beachfront vacation hideaway not only inviting but affordable and practical. So... just relax and 'Hide Away' or visit nearby theme parks, attractions, nightlife, exquisite shops, fabulous dinner/gambling cruises! Indulge in one of our many local restaurants to experience superb dining all within minutes of this condo. BBQ poolside at sunset with cocktails! Leave the car home and bike ride or take the Trolley with a pickup point within walking distance from your condo. The possibilities are endless. LONG DISTANCE ANYWHERE IN THE US AND CANADA (comes in handy when cell phones don't get reception) No need to hang off the balcony for a signal! WIRELESS INTERNET; No extra fees for secure unlimited access. FOR THE BEACH: beach chairs, beach towels, beach blanket, assorted sand toys, balls, games, paddles, and so much more. All on the premises. No need to haul or purchase pass times. Please call today for additional photos and updates. We are diligently working on your hideaway transforming it into your home away from home. Our repeat guests have made suggestions to make this property one of the best for beach living and we are implementing those changes on a regular basis. Be the next family to put your Footprints in the Sand! Check out our guest reviews from repeat guests who love this unit: the views, the location and so much more. Our primary goal is to provide a clean comfortable home away from home where families can rest, renew and create lifetime memories at one of the finest beaches in Florida. Thank you for taking the time to consider this property. We look forward to speaking to you personally and reserving your Footprints in the Sand! ADDITIONAL RENTAL INFORMATION: Minimum Stay: 7 days; Saturday to Saturday. Monthly rates are also available for select days. $500 Security Deposit; $59 CSA Insurance; Rental agreement will secure the dates of your request. Balance due 45 days prior to check in for the US; 60 days prior for international bookings. Calendar and rates subject to change. Footprints Vacation Hideaway at West Coast Vista. .. One of the best corner units on the south side of the building. Our family moved to Florida in June 1992. Before purchasing this unit, we scoped most beaches from the east to the west coast of Florida. When we found Indian Rocks Beach and walked into this unit, we knew we found our dream home away from home. The views, the turquoise gulf, the sugary white sand, the building itself; had everything we wanted and more. 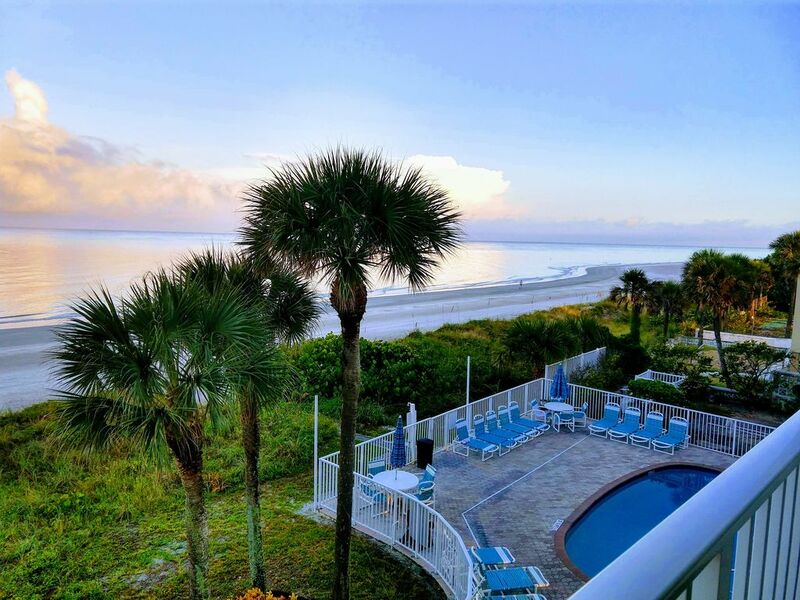 The best part of this location is its versatility -- private enough to just "hideaway" and enjoy beach living at it's best or explore some of Florida's main attractions. This location has it all. Some of the most popular benefits of this condo are its size and location. The building itself is private with a total of 15 units. At full capacity, it is private and quiet. The sand is soft and white and the water is crystal clear. The condo is situated in the 'Narrows' which is surrounded by the gulf and the inter-coastal. The photos are very deceiving. Most people, upon arrival, express how happy they are with the size of the unit and the views. It is very roomy and split into two sections: the gulf side and the intercoastal side. Come and check it out soon. Landline with 3 cordless phones for local and long distance calling anywhere in the US, Canada. Answering service available/do not disturb also available. Full Size Washer/Dryer in Laundry room inside this condo. Assigned parking. 2 parking spaces per unit. Parking passes must be displayed. Secure high speed password protected. Service for 6 - dishes - utensils - glassware. Also plastic ware for poolside and children. Abundance of books for all. Rainy day games also provided in 3rd bedroom. TWO (2) FULL-SIZE BALCONIES BEACH Balcony views the Gulf of Mexico INTERCOASTAL Balcony views fishing dock. West Coast Vista Guests only. Heated and private. We had such an amazing family vacation over the Thanksgiving Holiday. The condo is just perfect. Extremely clean, great location, beaches were perfect. Restaurants are all very close and food was amazing. We spent the mornings on the balcony of the inter coastal side of the condo and evenings watching amazing sunsets on the beach side balcony. We will be back!!!! Checks all the boxes on the list! A wonderful experience overall. Simply put, Tina cares. Unfortunately, the red tide was threatening this beachfront property and Tina did not shy away from being up front and honest about the conditions in the weeks/days before our recent vacation. Fortunately, our beach was for the most part unaffected. My wife did see several dead fish on one morning, but we never had any bad smells or respiratory issues during our week. Tina took the time to visit the property and give it her own "sniff test" since the red tide does adversely affect her. She reassured us 3 days prior to our visit... a testimony to her commitment to her guests having a quality experience. The lay out of the condo is perfect for families up to 6. I'm sure even bigger families would be OK, just that somebody's sleeping on the couch! We loved the two balcony set up. The unit sits directly on the beach so your west balcony(2nd floor) has a perfect view of the Gulf and sunsets while the east balcony overlooks Gulf Blvd, the intercoastal waterway, and the building's dock. It's completely possible to be on different sides of this building-wide condo and have all the alone time you need. Tina and John have given A LOT of thought in providing all the particulars needed for a family. Beach chairs, umbrella, pool/ocean floats, fishing rods (although no tackle box nor tackle for toothed fish), a plethora of books, DVD's, writing desk, binoculars, just to name several off the top of my head. The kitchen is fully stocked with every pan, dish, glassware, utensils needed. Full size fridge. If you're a BBQer, the pit is shared with other tenants and sits down by the pool. It's pretty big with a heavy iron lid, similar to what you'd see in a state park. It worked fine for my steaks, chops, and chicken I 'qued up. Lots of Gulf wildlife! Stingrays, crabs, manatees all seen our 1st day. The Clearwater Marine Aquarium monitors the multiple turtle nests and we were fortunate enough to see them explore a nest the morning after a "turtle boil". They extracted 6 live baby turtles that had yet to make it out. Pretty cool to see them set off for a new life in the ocean! There were dozens of shore birds. I was amazed at how many pelicans call this beach home. Terns, sand pipers, black skimmers, and cranes every beach walk. The beach itself was very pleasant and only populated with whoever else was staying at the building (12 units I think). Needless to say, not crowded at all. Unit was beautiful. Well maintained. It had everything we needed. The little things that were there made all the difference. Our family of 4 adults and 2 children stayed at Footprint Hideaway for one week and had a wonderful time. The condo is as advertised and Tina and Christen were easy to work with and quickly responded if we needed something. The beach is well maintained and is truly very very close! No long walks to get to the sand here. If you have a family member who wants to sit out of the sun, but still be outdoors, having the two balconies was fantastic. One is west facing and one is east facing. The bedrooms were all comfortable and the kitchen is well equipped! Tina, thank you again for a great stay! We love staying at Footprints! The unit is always clean and Tina and John have always been more than gracious hosts in allowing us to rent their place. They keep in contact with us throughout the week to make sure we are good and we have everything needed. The unit works perfectly for our family and we like the fact that you can sit out on the balcony and either view the inter-coastal or watch the sunset on the other balcony. I appreciate the fact that you form relationships with people that you rent from repetitively and Tina is a joy to work with! Words just can't express enough how wonderful this home away from home is! Our family stayed in Tina and John's condo a week and had one of our best vacations yet! The views from both balconies are amazing. I couldn't get enough of sitting on the gulfside balcony in the evenings, relaxing, reading and watching the spectacular sunsets. The layout of the condo is great with the living room on one end and the kitchen on the other. The beach felt like our own little paradise, it was never crowded and plenty of room. I loved that there were items in the condo that we didnt have to bring with us. Beach toys, towels,chairs etc. pretty much everything needed for a day at the beach. The location is awesome, truly a hidden hideaway, away from all the chaos that we've experienced in the past at more populated areas. Tina is a wonderful host! I can't say enough how accommodating they all were, Christen included, from when we first reserved the condo, check in, during our stay, and all the way to when it was time to go home and checkout. We are definitely looking forward to when we can go again! Indian Rocks Beach is a welcoming town of 5,000 and offers a little of everything from nature preserves and an art center to an historical museum. The "Narrows" is our unique location and well known for its versatility. Just hide away on our beautiful private beach or venture out to some of the most popular tourist attractions. (Listed below) Clearwater Beach, See Winter the Dolphin at Clearwater Marine Aquarium the star of two "Dolphin Tale" movies. Sunset Cruises, Gambling, Day Cruises, Fishing charters, Dinner/Dancing, Dolphin & Whale watching, etc, Theme parks such as Busch Gardens/Adventure Island Water Park, Disney/Sea World, Fabulous shopping ranging from up-scale boutiques to moderate stores minutes from condo, Golfing, Miniature Golf, Fine Dining along Gulf Boulevard where the Trolley takes you anywhere from Clearwater Beach to John's Pass. Close to vacation rentals like bikes, scooters, kayaks, stand up paddle boards, and more. PLEASE NOTE: RENTAL AGREEMENT IS REQUIRED WITH TERMS OF OWNER/BUILDING POLICIES TO SECURE ALL RESERVATIONS. Specials are available for select days.